hope. A collaboration: Sarah Hildebrand (photographs); Gerhild Perl; Julia Rehsmann; Veronika Siegl (essays). ‘hope’ emerged from the encounter and collaboration between artist & photographer Sarah Hildebrand and the social anthropologists & authors Gerhild Perl, Julia Rehsmann and Veronika Siegl. Taking the human body as their departure point, three artistic/literary/scientific explorations shed light on ambivalences of hope. In a Europe of political and economic injustice, existential uncertainty and increasing isolation, hopeful prospects are distributed unevenly. Spain. Hope of a better life in Europe, which opens borders for some and bolts them for others. Hopes that, for decades, have been shattered on Europe’s coasts and sunk in unpredictable waters. Human bodies that vanish in the seas and in cemeteries. The traces remain: remnants of inflatable boats, faded letters on gravestones, artificial flowers and the voices of the dead as well as of those who are linked to them in various ways. Russia. A couple’s hope for a child realized through the reproductive work of an unknown woman. A woman’s hope of providing for her own family through carrying an embryo for somebody else. Many months of uncertainty, subjected to self-control and the control of others. Tablets, injections, hormones, instructions, examinations. Crossing boundaries, where necessary; guarding boundaries, where possible. Germany. The hope of prolonging one’s life with a transplant. A person at the boundary between life and death. Being ill enough to get onto the waiting list for a new liver; staying healthy enough not to die before that crucial telephone call. Awaiting the death of another person as a condition of one’s own survival. The packed bag by the door, for months, if not years, on end. 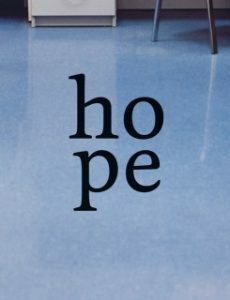 With photographs and narratives, ‘hope’ follows the traces of people who exceed physical, mental, emotional, moral, geographic and their own boundaries in the hope of something that, for others, is a given: a child; a longer life; a self-determined life.